Two years ago I decided to go paperless for class communications*. Instead, I started posting the PDF or Word versions of the documents in class news of SchoolZone for a set period of time. Then I would also post it for future reference in the reference section. What I ended up with was not very user friendly. * I do provide paper copies for families who request them. Last year what I decided to try was to create a heading for each subject area at the start of the year. I even colour coded the headings. As I had something to add to that subject area, I would go back to the date that heading was created on and edit that post or insert an additional document. So, for example, all math items would be together and easy to find. I set the end date for the end of the year for each category/post. I set the the "class" for each heading as "home room" otherwise SchoolZone will be helpful and order the topics alphabetically (art, English LA, etc.). I prefer to have my school start up information first followed by the core subjects. This led to another discovery. If you catgorize everything by "home room" the date you set as your start date matters when you set your resources page up this way. If you want General Information first, make sure it has a start date that is the LATEST. I found it useful to put all the information I sent home the first few weeks of school together under General Information. Then I had the core subjects, followed by everything else. You can have all the items under one "start" date but if you change your mind about the order you want them to go in, there is no easy reordering solution. Assigning each item/topic area a different start date was an easier way to manage the Resources page for me. 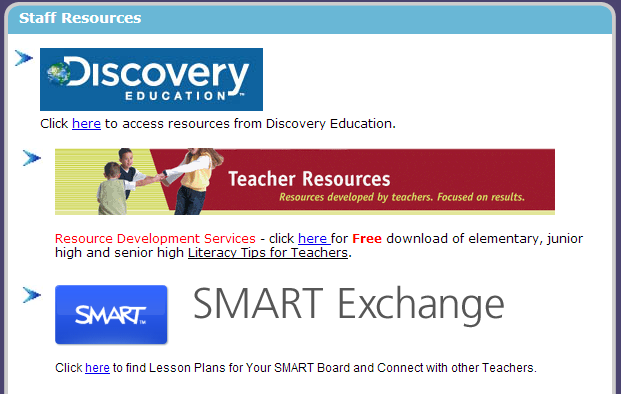 I am surprised at how many teachers still do not know that they can assess their Discovery Education (formerly United Streaming) through the staff resources section of the resources tab. You no longer have to remember that username or password! 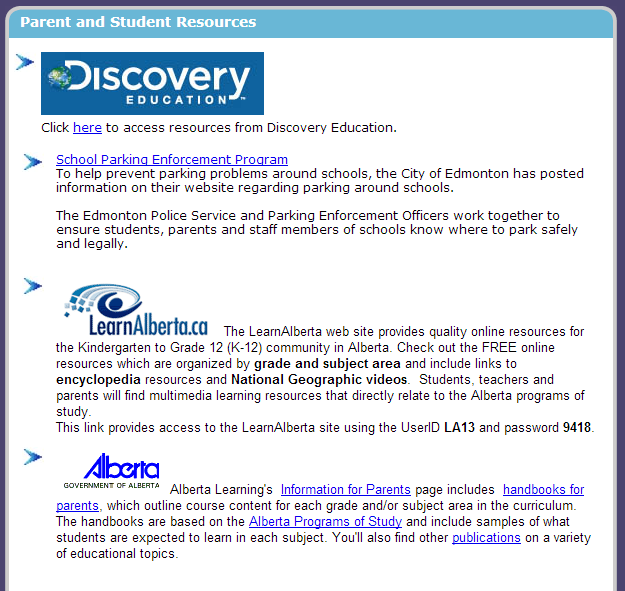 Parents and students also have access to Discovery Education through SchoolZone as well as access to LearnAlberta. no more workspace tab for schools that use Google Apps. 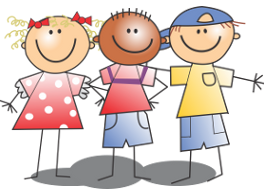 SchoolZone News said: "When teachers make changes to student files shared through the Hand In box, students will now get a flag alerting them of the change. Click here to learn more." Please post your September SchoolZone tips in the comments!